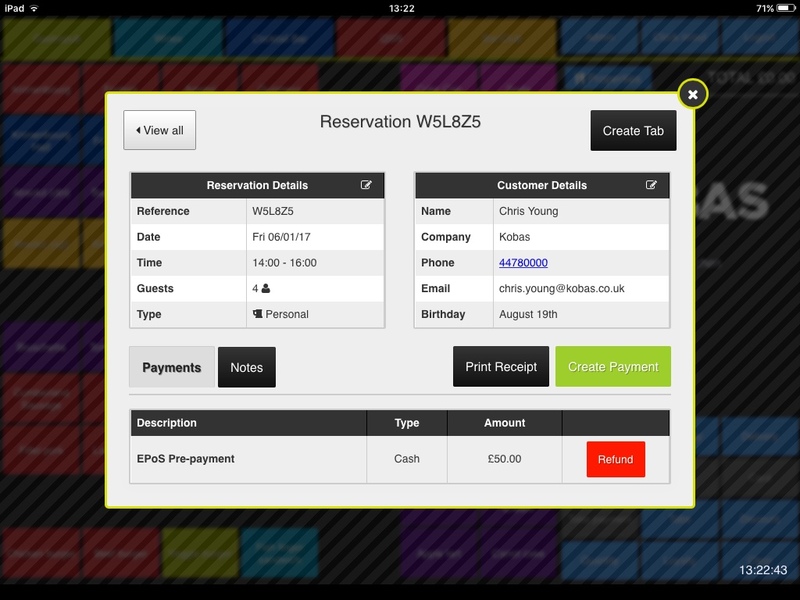 To create a reservation on EPoS, go to Admin > Reservations > Create. Reservations need to be linked to a customer profile in Cloud, so search for an email address or phone number, or scan the customer’s loyalty card if they have one. If no customer is found, you can quickly create an account for the customer by entering their name and either email address or mobile number. Choose a time and date for the reservation, and select the number of guests. You can also tag the reservation as “Personal” or “Corporate” if need be. You will then need to confirm the reservation and customer details, and have the option of sending a confirmation email to the customer. Your reservation is now created, and payments and notes can be added as necessary. To add a note to a reservation, go to Admin > Reservations, click View beside the relevant reservation, go to the Notes tab at the bottom of the screen, then tap Create Note. You can add notes up to a length of 255 characters, and can add multiple notes if needed. If you wish to make any edits or delete a note, then this can be done on the reservation in Cloud. In order to see a list of upcoming and previous reservations, go to Admin > Reservations. 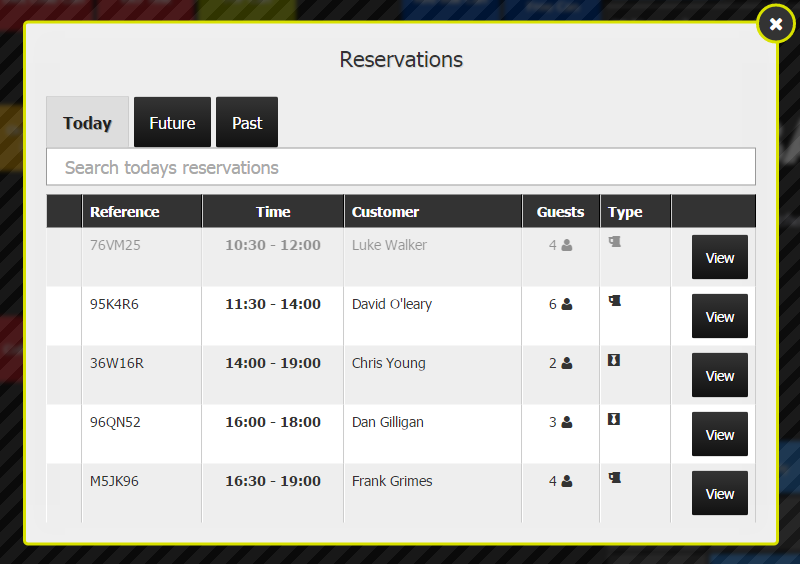 Today’s reservations are listed by default, but you can navigate to future or past reservations using the relevant tabs. When a reservation’s start time has passed, it becomes greyed out so that you can see where you are up to in the day’s schedule at a glance. Previous reservations are still able to be viewed or added to a tab, though payments cannot be added after the reservation’s end time has passed unless you edit the reservation to be later in the day. You can search by name or booking reference, and tapping View will give you a breakdown of all the information relevant to the reservation, including any notes or payments that have been added to the reservation. 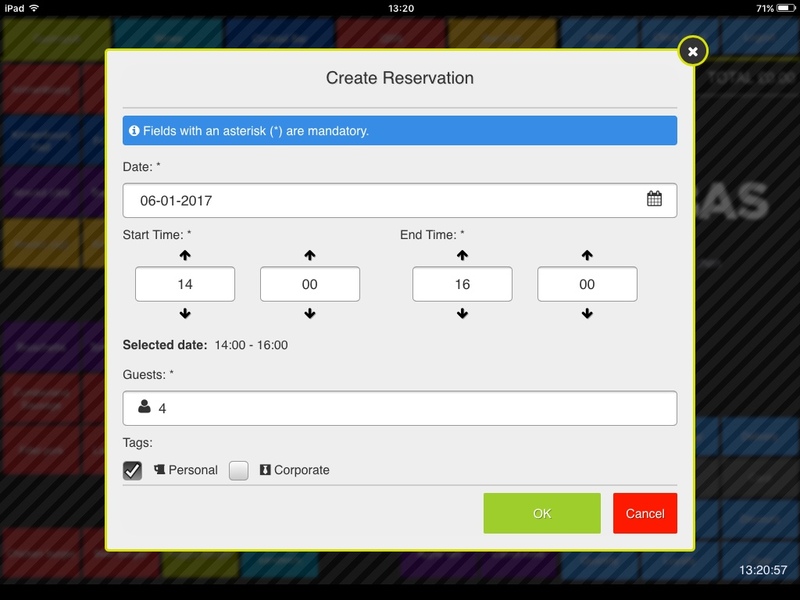 You can tap the black Reservation Details or Customer Details fields to make any required edits to the customer or reservation itself. There are two ways a reservation can be assigned to a tab – either through the Admin list view, or on the tab itself. Go to Admin > Reservations, and click View beside the reservation you need to assign to a tab. This takes you to the screen where you can review the reservation, so check you have the correct one and tap Create Tab in the top right corner of the screen. This creates a brand new tab that has the same name as the reservation. Covers will be automatically set to reflect the number of guests entered on the reservation. The tab will also be put in credit to the value of any deposit payments added to the reservation. Create a tab as normal, set the covers and name it. 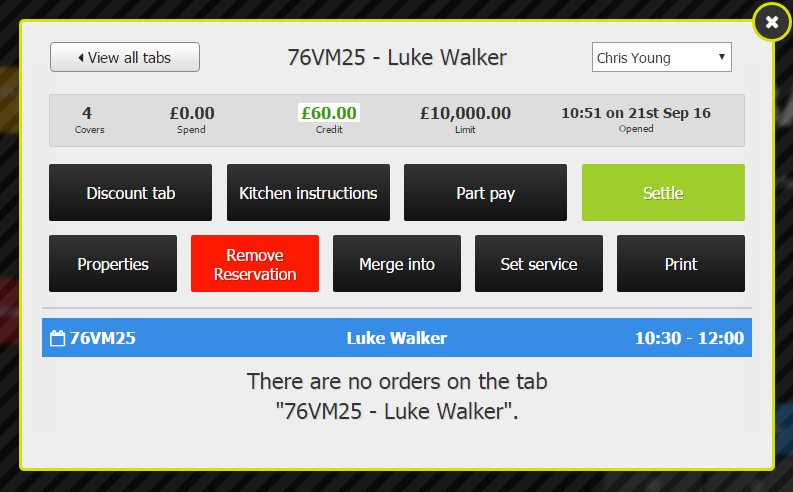 Once the tab is created, tap Add Customer, then Reservation, and you will be presented with the reservations list. Tap View on the reservation you wish to assign, then tap Add to Tab in the top right corner of the screen. If you wish to view any details about the reservation once it is assigned to a tab, you are again able to do this through the same routes. On the tab itself, there is a blue bar with the customer’s name; tap this and the reservation details will be displayed. Alternatively, go to Admin > Reservations, then click View on the reservation in question and again, the details will be displayed. To add a payment to a reservation, go to Admin > Reservations, click View beside the relevant reservation, then tap Create Payment. You can then take a reservation payment by cash, card or Other Payment Type. Any deposits received will be recorded under Total Deposits Received on the Till X, along with being recorded against the corresponding payment type used to place the deposit. You can print receipts for deposit payments – these include the booking reference, date and time of the reservation, and a list of any payments received or refunded, so are a handy reference for the customer to have to hand on the day of the reservation. Any deposits added to a reservation are added as credit when you assign the reservation to a tab and you can then add more part payments if necessary. Reservation deposits can be used to pay for both PLUs and gratuity. Once the deposit has been fully redeemed and the tab has been settled, the deposit amount contributes to the “Total Deposits Redeemed” row on the Till X/Z. When you run the Z report at the end of the session, this total figure is uploaded to Cloud and is included as a pre-populated field in the Closing Tasks Cash Declaration. This total figure is included as a row in Daily Tasks > Cash Logs, and the Cash Log report. Deposits can also be added to a reservation in Cloud, and are also able to be redeemed on the till via tabs. To refund a deposit, go to the relevant reservation on EPoS, and tap the Refund button. Alternatively, deposits can be refunded in full once the reservation has been added to a tab by going to Part-Payments > Manage Part Payments, then tapping Refund beside the deposit. 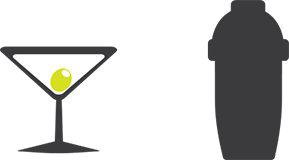 Only deposits added on EPoS can be refunded on EPoS, and only deposits created in Cloud can be refunded in Cloud. Note that any refunds processed will be added to the “Total Deposits Refunded” line in the Till X/Z, along with reducing the total of the payment type refunded (for example, refunding a £50 deposit in Cash will reduce the “Total Cash” figure on the Till X/Z by £50, as this money has been taken from the till to perform the refund). If there is still unused credit left on the tab when the reservation is settled, then this is treated as an “Unused Deposit” amount. As this is money that the business has taken and is not being used as gratuity, it is taxed at the full VAT rate of 20%. If you go to Admin > View till X report, then scroll to the bottom, you will see a “Total Unused Deposits” row that details how much revenue has come from these Unused Deposits. This figure is a subset of the figure in the “Total Deposits Redeemed” row under the “Totals” heading on the Till X/Z. As Unused Deposit amounts are taxed at the full VAT rate, these figures are printed on the receipt for your customers’ reference. Alternatively, you can remove a deposit from a tab by going to Part Pay > Manage Part Payments and then use the Redeem Deposit method to settle the tab, ensuring that the value of what was actually redeemed is assigned to the “Total Deposits Redeemed” field on the Till X/Z. This will ensure that only the value of the goods on the tab is redeemed if you do not wish to charge the customer for the Unused Deposit amount. If you have any reservations still open at the point you run your Till Z report, then these reservations will need to be dealt with first. If you attempt to close the session without doing this, you will be taken to a list of open reservations from the day. At this point, you will need to either reschedule the reservation for a future date, or mark the reservation as a No Show. After a reservation’s end time has passed, the Create Payment button on the reservation is replaced with a Mark as no show button. Once a reservation has been marked as a No Show, any associated deposits are added to the “Unused Deposits” line on the Till X, and the ability to make edits to the reservation in Cloud is locked down. If a customer shows up shortly after their reservation has been marked as a No Show, then there is a button that will undo this in the top right corner of the reservation. However, once the current session has been closed, the status of the reservation as being a No Show cannot be undone, and a new reservation will need to be created. As No Shows essentially sacrifice their deposit to the venue, there isn’t a way to refund any No Show deposits after the day’s till session has been closed. Therefore, if you wish to honor a No Show due to the customer’s circumstance for missing the reservation, we advise awarding their customer profile in Cloud a series of “£__ off” discount vouchers to the value of their original deposit. For more information on creating these vouchers, please see the “Discounts” section of our Guide to Promotions and Discounts. For more information about reservations on EPoS, please contact support. For information about creating reservations in Cloud, please see our Reservations in Kobas Cloud guide.